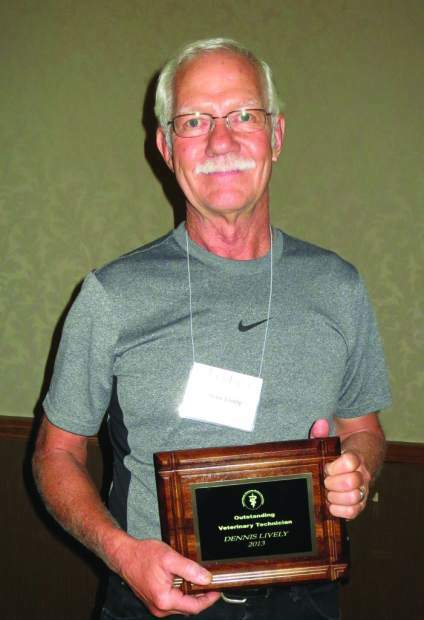 Dave Gaer, Newell, was honored with the Bill Davis Memorial Award. Photo courtesy S.D.V.M.A. Dennis Lively, Rapid City, was presented the Outstanding Veterinary Technician award. Photo courtesy S.D.V.M.A. Dr. Dustin Oedekoven, Pierre, received the Emerging Leader Award. Photo courtesy S.D.V.M.A. Dr. George Twitero, Rapid City, received the Distinguished Service Award. Photo courtesy S.D.V.M.A. 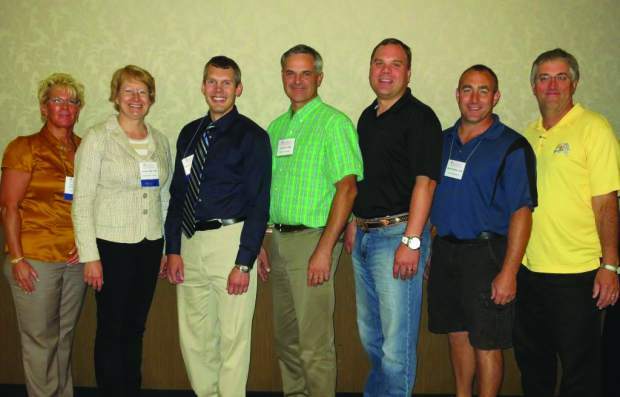 Over 200 veterinarians and veterinary technicians took part in the 122nd annual South Dakota Veterinary Medical Association meeting in Sioux Falls, S.D., Aug. 11–14. The meeting featured sessions on companion animal, food animal, equine medicine, and social networking, and included case reports from SDSU Animal Disease Research and Diagnostic Lab faculty involving current animal disease issues. 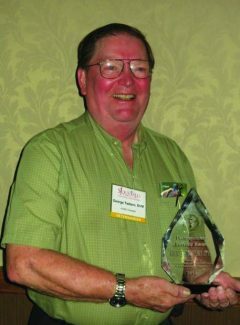 The Distinguished Service Award honors an individual showing devotion to the care and well-being of animals, support for the profession, and contributions to the community. This individual supports veterinary medicine, research, colleagues, and/or students. Dr. George Twitero of Rapid City, who practices at the Black Hills Animal Hospital along with Dr. Mike Anderson and Dr. Melissa Mez, received the award. Twitero grew up on a farm near Sisseton. He went to South Dakota State University for his pre-vet, and received his DVM degree from the University of Minnesota. He then served in the Army Veterinary Corps, including a year in Korea. Dr. Twitero started in large animal practice in Milbank under the guidance of Dr. Dale Foss and Dr. Wendell Peden. He moved to Rapid City in 1972 where he and Dr. Peden were in partnership in the Black Hills Animal Hospital. Dr. Twitero has been a long-time supporter of organized veterinary medicine, attending numerous national and regional conferences around the country. He has served as president of the SDVMA and worked on numerous committee appointments. He was a member of the national Judicial Council of the American Veterinary Medical Association and has served for 16 years as the South Dakota delegate to the AVMA House of Delegates. 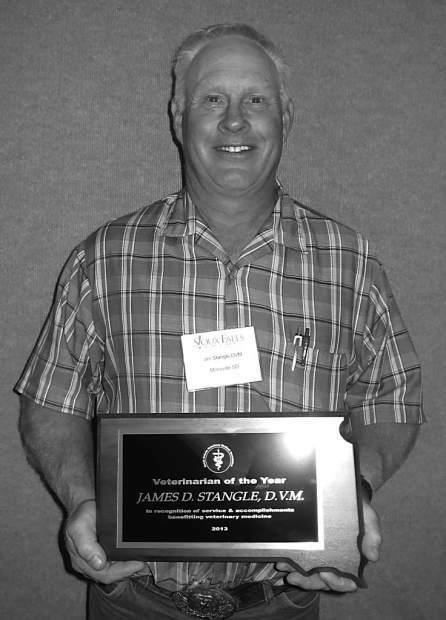 In 1994 he was recognized by the SDVMA as Veterinarian of the Year. Dr. James Stangle of Milesville was honored as SDVMA's Veterinarian of the Year. The award recognizes a member for service and accomplishments benefitting the profession of veterinary medicine. Stangle grew up in western South Dakota. After earning his DVM from Colorado State in 1989, he returned to western South Dakota. He started his own clinic in 1996, added a satellite clinic in 1998, and hired an associate in 1999. He practices mainly large animal. Jim is a member of SDVMA, American Veterinary Medical Association, American Association of Bovine Practitioners, Academy of Veterinary Consultants, and Society of Theriogenology. He served on the SDVMA executive board and is a past SDVMA President. Jim lives in Milesville with his wife Linda and 4 children, Jennifer, Sam, Ben, and Mark. The Emerging Leader award is made to an SDVMA member who graduated from veterinary school in the last 10 years and has displayed outstanding accomplishments in veterinary research, private practice, regulatory services, civic activities, and/or organized veterinary medicine. This award is intended to recognize the immense talent we have entering the profession in our state. Dr. Dustin Oedekoven received the Emerging Leader award. Dr. Oedekoven serves as the State Veterinarian and Executive Secretary for the SD Animal Industry Board (AIB), a position he was appointed to in 2009. He began his career with the SD Animal Industry Board in 2003 as a Staff Veterinarian. In 2006, he accepted the position of Assistant State Veterinarian. Oedekoven grew up on a ranch near Sturgis. He graduated from Sturgis High School in 1995. He attended South Dakota State University from 1995 to 1998 and received a BS in Animal Science. 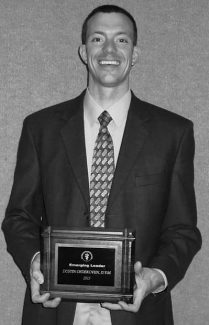 He graduated from Iowa State University College of Veterinary Medicine in 2002. He began his veterinary career in Sheridan, Wyo. before returning to South Dakota. Throughout his life Dr. Oedekoven has been an active member of numerous professional, public, student and community oriented organizations. He currently serves on the United States Animal Health Association's Board of Directors and as the Chair for the Committee on Tuberculosis. He also serves on the SDSU Animal Disease Research and Diagnostic Laboratory Advisory Board. During his career with the SD AIB he has facilitated the structuring of South Dakota animal health laws dealing with Trichomoniasis, Johne's, Scrapie, and CWD control along with effectively administering those laws that have been long established. In 2011 he was awarded the SDSU Distinguished Young Alumni award. Oedekoven and his wife Jenn make their home in Pierre with their children Morgan, Madison, Alex, and Sarah. The Outstanding Veterinary Technician award is made to a registered veterinary technician who has provided outstanding support to veterinary medicine through dedication to the care and well-being of animals and professional knowledge and execution in service to the profession. 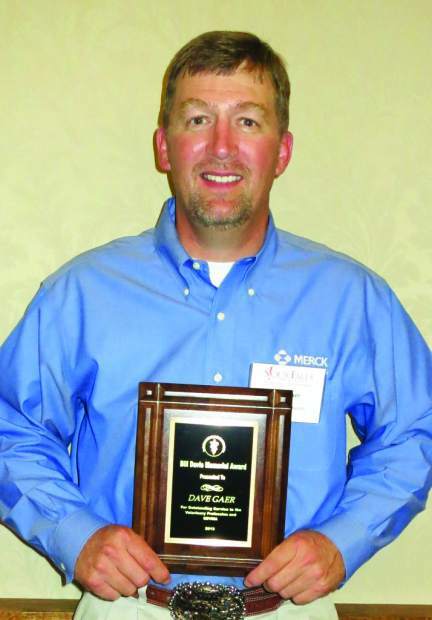 Dennis Lively was named this year's Outstanding Veterinary Technician. Dennis was instrumental in developing the South Dakota Association of Veterinary Technicians and served as president/treasurer for a number of years. He served as president of the National Association of Veterinary Technicians (NAVT) in 2005 and was a member of the NAVTA Executive Board for 3 years. In 2007, he became a member of the NAVTA staff as head of advertising, which he did for several years. Lively attended Pittsburgh State University in Pittsburgh, Kansas and graduated with a degree in education. He spent the next four years in the Air Force, stationed in North Dakota and then Hawaii. After his time with the Air Force he attended the University of Minnesota – Waseca graduating in 1976 with a degree in Veterinary Technology. He worked as a veterinary technician in a mixed animal practice in Kalispell, Mont. In 1982, he accepted a position at National American University as an instructor in the Veterinary Technology Program. He still serves in that capacity today. He is in charge of all the clinical pathology, parasitology, and bacteriology lecture and laboratory classes; the office management class; and assists in the anesthesia and surgical procedures classes. In addition to teaching veterinary technician students, he owns and operates a small diagnostic lab for local practitioners. Dennis resides in Rapid City with his wife, Peggy. He has two children, Jeff and Sarah, and eight grandchildren. 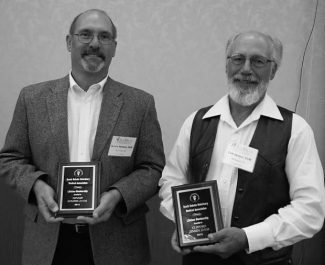 Roger Clement, Watertown; Clifford Jensen, Whitewood; and Dennis Somers, Sioux Falls; attained life membership status in the SDVMA for their years of practice. Dave Gaer, Newell, received the Bill Davis award. 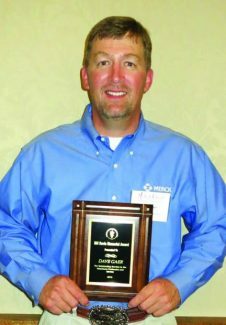 This award is given annually to a sales representative of a veterinary supply company who has demonstrated an unusual degree of service and assistance to veterinarians and the veterinary profession in South Dakota. Gaer graduated from Montana State University with a degree in Animal Science and Ag Business. He worked for Western Ranch Supply in Billings, Mont., traveling throughout the state until he was hired with Fort Dodge Animal Health and relocated to Oregon. 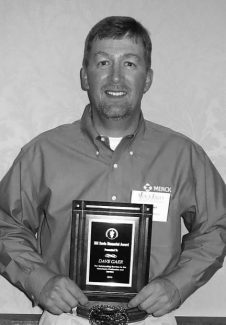 While at Fort Dodge Animal Health he worked Oregon, Washington and Idaho territories and received the Rookie of the Year award in 2009. In the years following he obtained three additional Presidents Awards from Ft. Dodge, the highest honor for their salespeople. 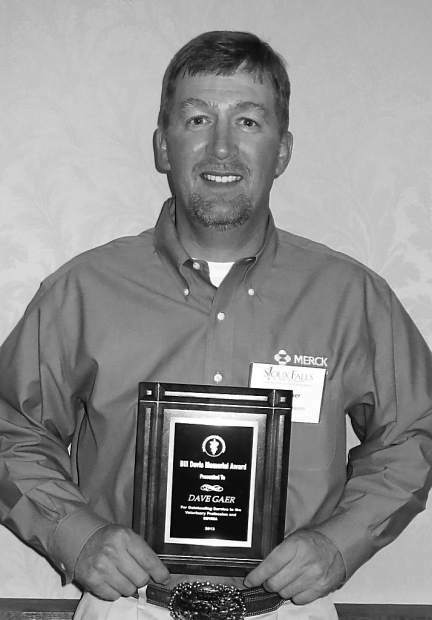 In 2012 Dave accepted an opportunity with Merck Animal Health and continues to manage western South Dakota on their behalf. He lives in Newell with his wife Lee Ann and four children, Tyler, Tori, Tucker and Taylor. The SDVMA Alliance raised over $9,100 for scholarships for veterinary and veterinary technician students.